Edit the _content_ macro in home.dm, adding the link where you want it. The link will look something like <p style="background:white;"><a href="_httppagex_(mypage)">My Page</a>. Create the macro file:Create a new file called mypage.dm in gsdl/macros. The URL for the new page can be specified internally as _httppagex_(mypage): this maps to your library address with cgi arguments a=p&amp;p=mypage. You can change the logo ("greenstone digital library software") that appears at the top of the front page of your library by editing the home.dm file in your Greenstone "macros" folder and replacing all instances of "gsdlhead.gif" with the name of your logo image file. if you set this to "_ifeellucky_" then there will be an "I'm feeling lucky" checkbox in the search form. If you tick this then "&ifl=1" goes into the search URL, and code in the C++ redirects you to the first matching document rather than the normal search results page. 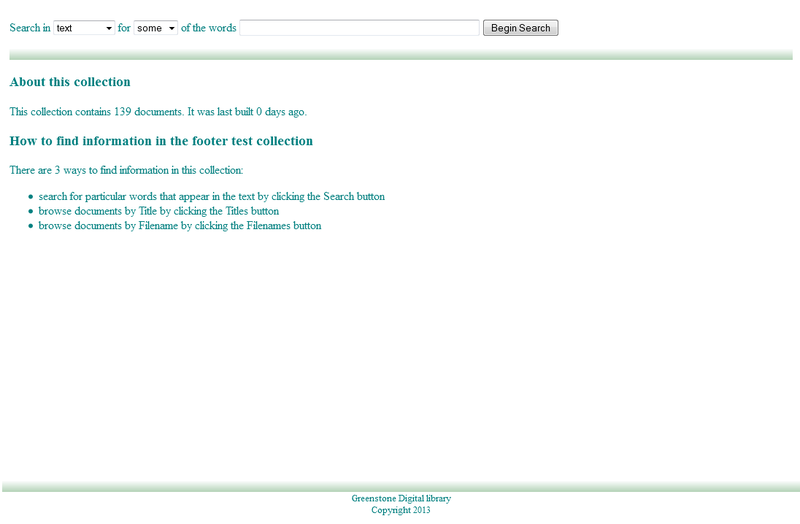 When you add a footer to Greenstone, the footer will appear directly after the content of the page. So, if there is little content on a page, the footer will not be at the bottom of the browser window. The following CSS ensure the footer is at the bottom of the page (as shown in the image). Contributed to the mailing list by Yvan Arnaud. Does anyone have experience with setting up website analytics and hit tracking for a Greenstone library? It seems like the way each page is created dynamically would complicate this a little bit, but I'm wondering if anyone has tried to track for example what are more common search terms or which browsing classifiers are utilized more often. I didn't find any tutorials on this topic. I tried Piwik for Greenstone web analytics (http://piwik.org). It's an open source php/mysql web application so you can freely install it on any web server. Have a look to the online documentation to know how to install it on your own server. Of course you will replace ://myserver/piwik with your own piwik url. I think you could do something similar with other web analytics tools like Google Analytics or Open Web Analytics.